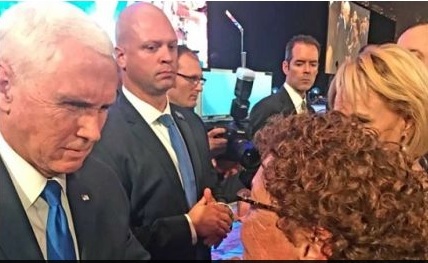 A heartwarming meeting took place at the annual conference of the Israeli American Council in Florida on Friday, when twice bereaved Israeli mother and Israel Prize laureate Miriam Peretz embraced U.S. Vice President Mike Pence after his speech at the event. “U.S. Vice President Mike Pence gave a speech about love and ties with the people of Israel, a speech that moved us,” Peretz wrote on Twitter. “When he finished his speech, I told him that I had lost two sons to war, and his speech has given me strength because it was a speech of hope, and that’s what we needed to hear. Thank you very much,” Peretz wrote. Peretz was awarded the Israel Prize this spring for her work as an educator. Her two eldest sons, Uriel and Eliraz, were killed in the line of duty – Uriel in Lebanon in 1998 and Eliraz in Gaza in 2010. Following her sons’ deaths, Peretz became an inspirational speaker and devoted her life to working with teenagers and soldiers.